This August, I finished a large cut feather installation in the entry of a lovely Puget Sound home. Since the windows face the water, gull shapes cut from blue macaw feathers were positioned to fly in to rest on the right wall. I called it Coming Home. As I was finishing up the installation, on a scaffold by the upper window, I glanced out occasionally to see gulls flying by. MCE . 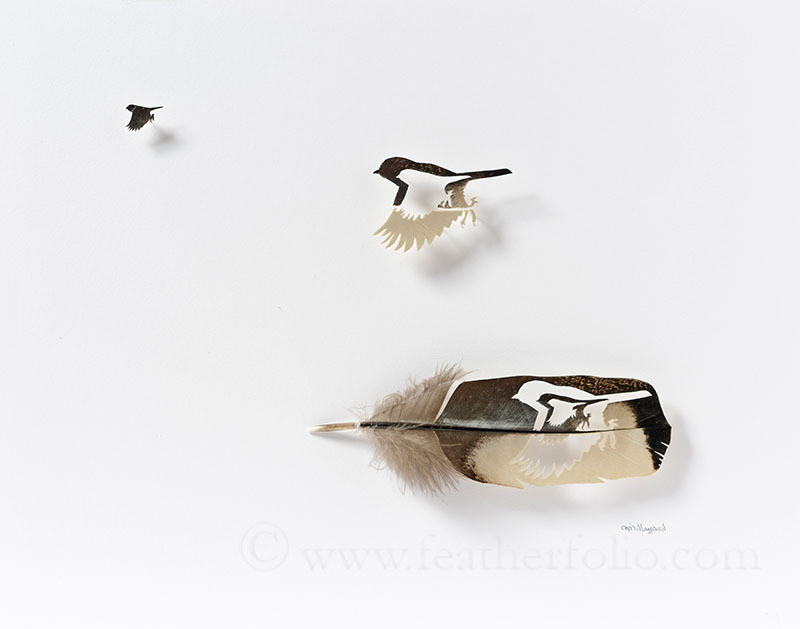 marabou stork feather . 17" x 14"
Many people say my art is completely original but it is not. I mean I developed a technique using technologies already created, I use common accepted design practices, and I am influenced by other artist. Case in point: Maurits Cornelis Escher. He used tessellation to create many of his designs, repeating shapes that totally fill a plane with no space left over. The visible feathers on a bird’s body does it too, appearing like overlapping diamond-shaped shingles. 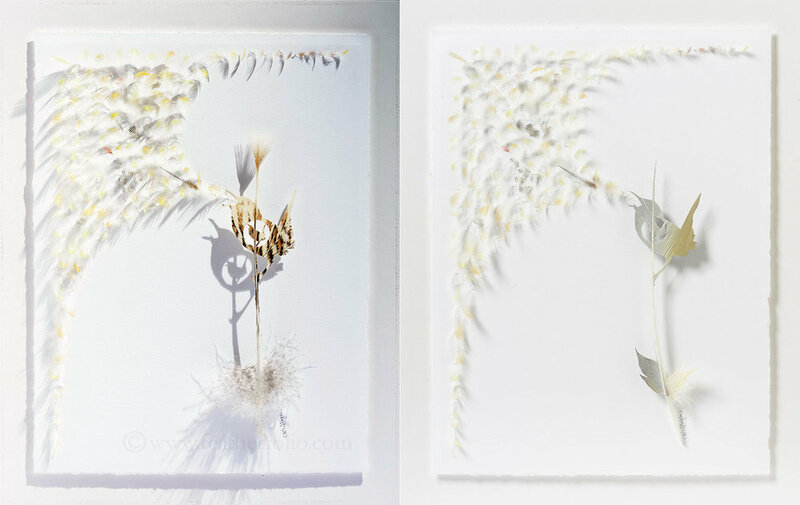 Much of July I spent designing, cutting, gluing and arranging prepared feathers in the silhouettes of gulls for an installation commission. These installations are different than most of my previous work in that they not restrained by the protection of shadowboxes. They are larger and can be more free-form, adapted to their environment, the walls where they are installed. I was thrilled to create the first three large installations of my feather carvings at the Bainbridge Island Museum of Art this March. They are out of the box, literally. 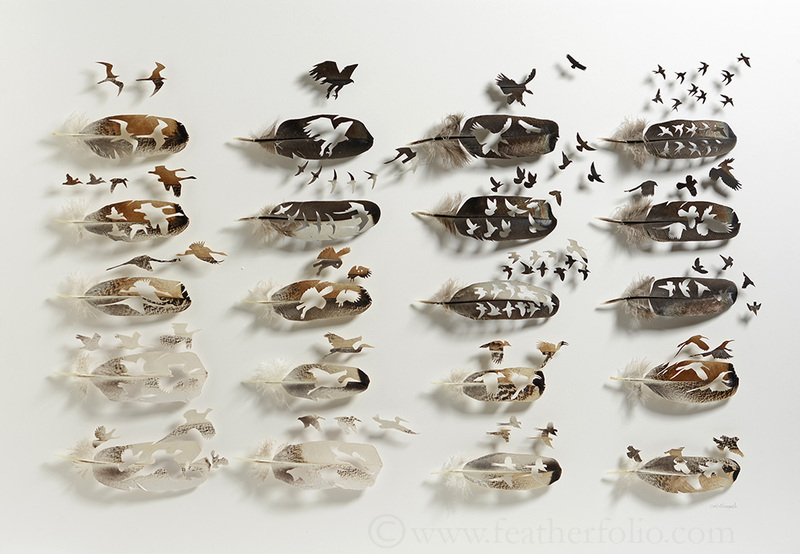 No shadowboxes, so the feathers and cutouts are pinned directly to the wall without any protection. 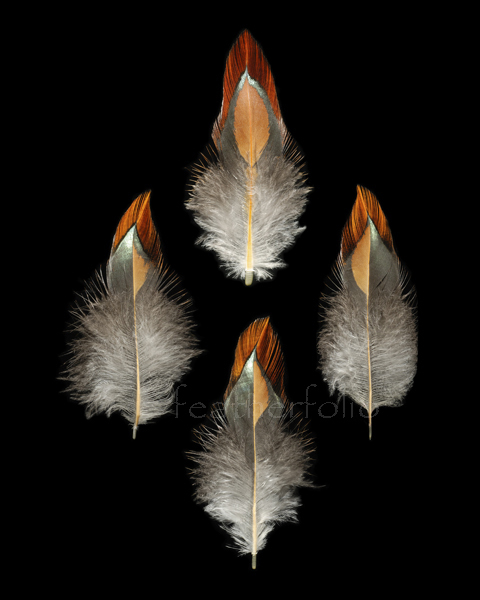 The stabilized feathers are tough but the pinned feathers and cutouts could be damaged by leaning against them so they needed to be placed away from traffic and high enough to be out of the way of exuberant dogs and cats and kids. They are cleaned of dust with a strong stream of air. The feathers deter pests from eating them as their backing and stabilization treatment does this. These installations can be large and made to fit any space. It takes a lot of time to prepare and cut the feathers but the installation on-site goes fairly quickly. I will go anywhere in the world to create these.